American Fence Company always has something in the works, and 2018 has really been a huge year for us in terms of growth. Along with the other new divisions we’ve launched this year —American Access Company and American Playground Company—we’re excited to announce that we are now offering landscaping services with our new division American Landscape Company. 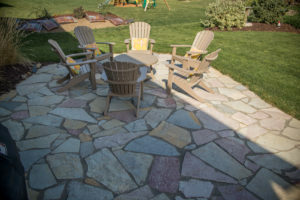 This new venture was proposed and lead by American Fence Company of Lincoln, who already has a couple completed landscaping projects under their belt. A few of American Landscape Company’s specialties include retaining walls, sod and irrigation installation, railings, decks, patios, landscape design, fire and water features, and more. Show off your own unique style on your property through the impressive art of landscaping. A well planned and maintained landscape will not only leave a great impression, but improve mood and raise your spirits. Designing and planning your landscape helps set your property apart and gain positive attention. Our commercial and residential customers and our vendors put all their trust in us and we pull through to maintain that credibility. We are a licensed and insured outdoor construction company with a hands-on approach from the beginning of design to the end of installation. American Landscape Company has a team of experts who work around the clock who can tackle an entire array of projects. Please submit an online request to American Landscape Company or give us a call at 402-325-9255 to discuss your options and get a free estimate today.